Hiroshima Peace Memorial, called Genbaku Dome , the Atomic Bomb Dome, or the A-Bomb Dome by the Japanese is a UNESCO World Heritage Site located in Hiroshima, Japan. It was established as such in 1996. The building was originally designed by Czech architect Jan Letzel. It was completed in April 1915, and the new building was named the Hiroshima Prefectural Commercial Exhibition (HMI). It was formally opened to the public in August that year. The 6 August 1945 nuclear explosion was almost directly above the building (the hypocentre was 150 meters / 490 feet away), and it was the closest structure to withstand the explosion. 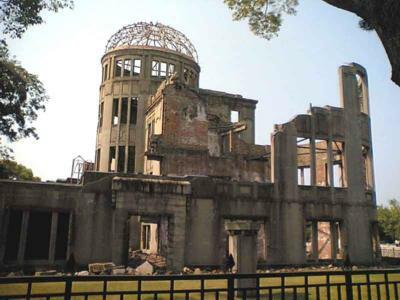 The building has been preserved in the same state as immediately after the bombing, and now serves as the reminder of nuclear devastation and as a symbol of hope for world peace and elimination of all nuclear weapons.